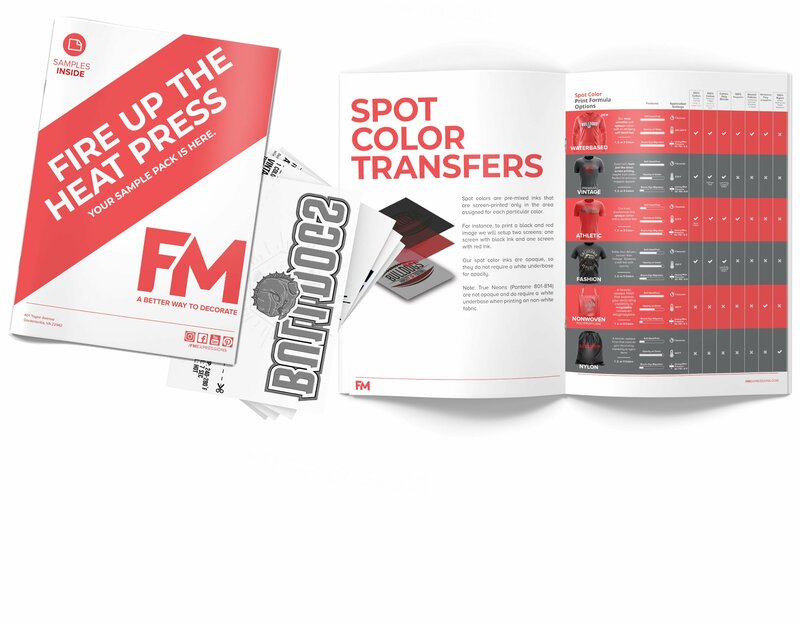 Request Your Free* Sample Pack & Heat Transfer Guide! Step by step instructions on how to set up your heat press and apply your samples. Samples of each of FM’s print formulas that can be applied and tested. Quickly see which formula to choose based on your garment type. Application instructions included, too! (1)Free Sample Pack Applies to 50 United States, U.S. Territories, Mexico, and Canada. (2)Other Countries/Territories: While Our Sample Pack Is Free, You May Have Associated Postage Costs. (3)Customers May Order One Free Sample Pack per 365 days, additional sample packs within the 365 day window are available for a nominal fee. An error occurred processing your request. Try reloading the page. If the problem persists, feel free to contact us and let us know about it. Just enter a password, let us know how you heard about us and your sample pack will be on the way! Password Requirements: 8 character minimum, 1 uppercase, 1 lowercase, and 1 number. Looks like you've already received your free product guide and sample pack. Want more? Just enter a quantity below and add them to your cart. Your order has been processed and should be on its way to you soon. You should be receiving an email shortly to confirm your account.